A popular family dinner recipe, this Cheesy Baked Rice gets a healthy makeover! 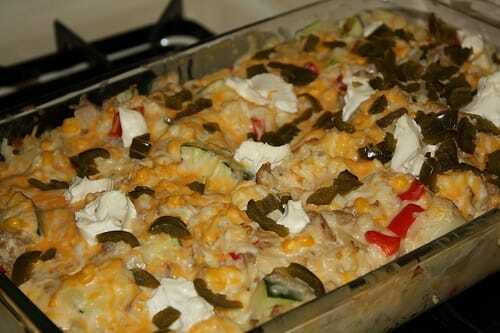 Still boasting all of the cheesy rice goodness that we all adore, this low calorie casserole recipe is bulked up with veggies and a high fiber rice, making each 1 cup serving just 6 Points. Also, by using a yogurt based cheese sauce, I was able to pack in some extra protein too, which helps to keep the Points value down, while adding a delicious flavor and moisture to the dish. If you aren’t into spice, feel free to leave the jalapenos off, but I LOVE the extra tangy zing they offer. This healthy casserole recipe makes a great dish to bring to a potluck, or to make a few days in advance, freeze, and then reheat for a quick family dinner. So yummy, and a great way to get your kids to eat more vegetables! A low calorie casserole recipe that is not only good for you, but is smothered in cheese sauce, filled with sausage, and is just 6 Points per serving!??! Um, YES, please!! This healthy casserole recipe put a new spin on traditional cheesy baked rice casseroles that will knock your socks off. It makes for a delicious and healthy dinner that the whole family can enjoy, but will still keep you on track with your Weight Watchers Points Allowance. Pour rice into a 9-by-13-inch baking dish. Bring broth to a simmer in a small saucepan. Stir hot broth into the rice along with zucchini, bell peppers, onion, paprika, salt and pepper. Cover with foil. Bake for 45 minutes. Remove foil and continue baking until the rice is tender and most of the liquid is absorbed, 35 to 45 minutes more. In a small saucepan, whisk together milk, yogurt and garlic. Cook over medium heat until bubbling and thickened, 2 -3 minutes. Reduce heat to low. Add 1 cup shredded cheese, corn and cilantro and cook, stirring, until the cheese is melted. Set aside. Spray a large skillet over medium heat and add sausage. Cook, stirring and breaking the sausage into small pieces with a spoon, until lightly browned and no longer pink, about 4 minutes. When the rice is done, stir in the sausage and cheese sauce, ad dollop the cream cheese by the teaspoon, over the casserole. Sprinkle the remaining 1/2 cup cheese on top and top with jalapeños. I don’t know the Points value for this recipe without sausage, so you’ll have to add up all the nutritional info when you make it and re-calculate the total. If you doubled the sausage, what would the points be? Thanks Lori! Offhand, I don't know what the new Points Plus value would be, as the nutritional stats are based on the entire recipe, and I don't know offhand how much of them relate specifically to the sausage. You'd have to re-calculate it yourself based on the nutritional info for the ingredients, and how much of them, you use. I layered the rice mixture with the cheese sauce and topped with the additional half cup of cheese.